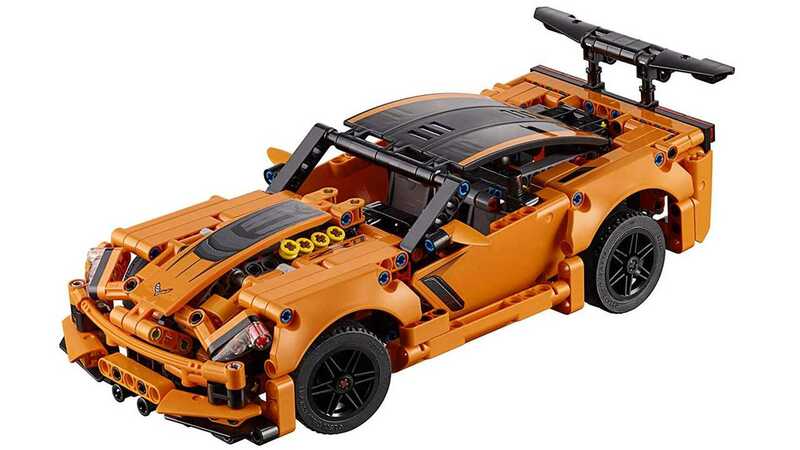 Waiting until a few days after Christmas to launch a new Lego Technic kit that would appeal to kids and adults seems like an odd business decision. But if you're returning any unwanted gifts, there's a chance to pick up the new Corvette ZR1 Technic set what would look awesome on any bookshelf or desk. The Lego kit consists of 579 pieces. When complete, it measures 11 inches (29 centimeters) long and 4 inches (12 cm) wide. Instead of the standard version, builders can also complete the model as a hot rod, and in this case, the machine is 9 inches long. The ZR1 kit includes neat features like visible moving pistons for the V8 engine and working steering. Just like the road car, there are four tailpipes emerging from the back, a big rear wing, and black wheels. The kit is available in the United States on January 1, 2019, retailing for $49.99, and you can pre-order it now using the link below. The little 'Vette is on sale now in Europe for 39.99 euros. The full-sized Corvette ZR1 has a 6.2-liter supercharged V8 making factory rating of 755 horsepower (563 kilowatts) and showing 706 hp (527 kW) at the rear wheels on Hennessey's dyno. At a base price of $119,995, it's sort of a bargain for the level of performance that buyers get, given the top speed of 212 miles per hour (341 kilometers per hour).